I will proceed as follows: First I will expand the conceptual model for how emotion should be modeled within AMEE. Then I will outline two avenues of expansions that could be made to low-level musical alterations in AMEE: Expressive Performance & Instrumentation/Sound synthesis. Each these topics will be broken down and explored in detail. I will conclude with directions for future research. AMEE’s initial prototype goal was stated as “dynamic music generation” it proceeded by first considering only musical score generation. This was an important focus as they developed a powerful, pipelined architecture for composition that is flexible, modular and extensible. This pipeline overseas the generation process of musical blocks as follows: The section producer is called on to get a new section of the piece, the block producer then returns a block (phrase), this is filled in with notes by the line producer and the completed block is sent to the output producer for synthesis. At each stage the emotionMapper class can make alterations adjustments to the music specified by the user. Since their target application is video game music, it is necessary that the system be capable of sound synthesis rather then musical score data only. Currently AMEE does this by sending the generated score, which is stored in MIDI format, to the default JAVA sound library for synthesis. However, this has resulted in some limitations. They mention that “some emotional changes are not as easily perceived as others” and they identify that future development is needed to both musicality and instrument quality. . The main contribution of this thesis is to change the overall perspective of AMEE to address the root of these issues. I propose that AMEE be viewed as an expert system for real-time orchestral composition and performance. This system is supposed to supplement the role of a real composer and orchestral performance. We must understand how an orchestra functions at all levels in order to correctly model an algorithmic approximation of one. Otherwise the system will be limited; for example, AMEE does not include instrument arrangement or the role of a conductor. Composition: The static elements one would find on a musical score within an orchestra (including global settings). This includes the musical notes, key signature, articulation marks, global tempo, time signature and volume. Performance: The parameterized directions imparted by a conductor on a group of musicians. This involves the shaping of all audible performance parameters such as tempo, sound level, articulation, in order to contribute to the emotional communication of music [KTH]. In simple terms, this is the difference between a deadpan mechanical production of music and an expressive performance (See Apendix). Synthesis: The instrument arrangement or equivalent electronic synthesis of sound to match the desired mood of the piece. In an orchestra the process of arrangement involves informed instrument choices for specific musical segments according to the mood. More specifically, this relates to all of the sonic aspects of sound unrelated to pitch and volume, commonly described as timbre. AMEE currently considers C, a very primitive version of S and ignores P all together. In the following sections I will explore P and S in detail. I propose that even though C, P and S could be linked to a single mood, the system would be more powerful and flexible from a users perspective if they could adjust C, P and S independently. This is a closely resembles how choices are made in a real orchestra: a composer creates a piece with some desired mood, an arranger interprets the score to match the emotional needs of the application (film or video game score, music therapy, live performance…etc.) and the conductor directs the individual musicians performance to fine tune the emotional expression of the work. If AMEE could adapt this CPS framework then it would offer the user a unique way to simulate all aspects of mood control. It would offer 3 degrees of freedom to find the correct mood for their specific application as opposed to the single degree of freedom currently offered. I feel it is important in an automated music system to decouple the creative decisions on this high level whenever possible – otherwise we are limiting the user. 3. Note On event: This message is sent when a note is depressed. 4. Note Off event: This message is sent when a note is released. When a musician performs or composes a piece of music to match some desired emotional quality, they will adjust the above features. For example, they may play slower or increase articulation (Articulation = Note On event – Note Off event). Emotions are viewed as complex psychological constructs, although, when encoded into MIDI data some common patterns emerge. Recall we are not trying to define emotion, but rather define links between emotional descriptors and primitive aspects of low-level musical representation. In this way we can view emotions as well defined regions within a possibility space. Or more precisely, every possibility space can be colored according to dominant emotional affect within some region. 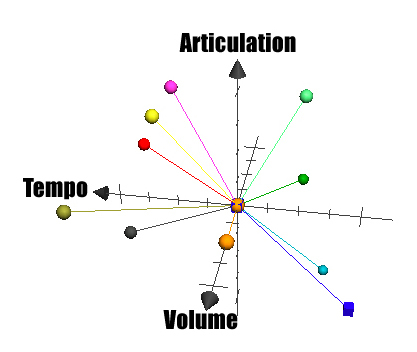 AMEE’s emotionMapper (defined in following section) controls the following elements: tempo, dynamics, articulation, mode, tonal consonance and pitch. This defines the 6-dimensional space that AMEE alters in order to communicate emotions. Based on the values of these features learn to classify a musical signal into categories using multidimensional scaling. Using a classification procedure to learn rules is a logical approach to develop expert systems. Although well known musical rules exist, classification algorithms provide us with more detailed data that would not otherwise be known. I present this here to inform the following discussions on emotion control and low-level features. Issue 1 – If new low-level elements (dimensions) are included in the system, then each dimension must be independently linked to every emotion slider. If the low-level element is difficult to understand at a high level, (such as spectral similarity or timing deviations) then this process becomes time consuming and imprecise. This same logic applies if we were to include a set of new emotion variables. Issue 2 – This process cannot be automated since it’s up to the programmer to define how each emotional variable is linked to new dimensions. This can lead to inconsistencies and result in an unclear picture of how the system models emotion. If we were to include 10 new low-level attributes (as described in the following section) then 10 different programmers would give 10 different answers. These plots clarify how adjusting an emotion variable is equivalent to extending along the corresponding emotion vector. 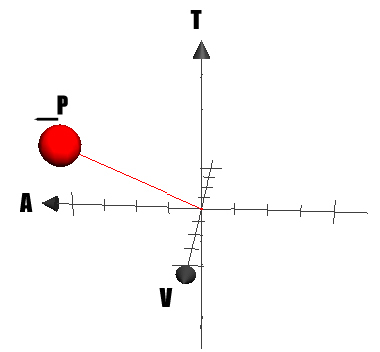 A neutral setting would exist as a point in the center of both graphs, as we increase happiness, the points would travel along the red vector. Notice how emotions that are well-defined opposites have inverse directions in both graphs (such as happy-sad and serene-angry). It is challenging to assign unique meanings to each emotional state; a dimensional approach allows us to strategically decompose them into the underlying components. 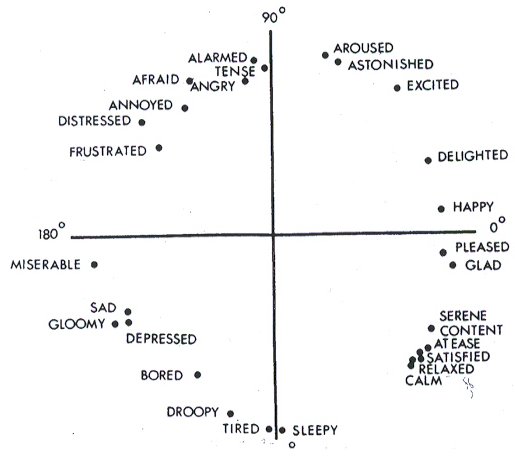 This view is well defined in a 1954 article by Schlosberg titled “Three Dimensions of Emotion” . The two primary dimensions were one of affective valence (ranging from unpleasant to pleasant) and one of arousal (ranging from calm to highly aroused). A third dimension was called dominance or control which the submissiveness or dominance of an emotion (angry is more dominant, scared is more submissive). Dimensional views of emotion have been advocated by a large number of theorists through the years, including Wundt (1898), Russell (1974), and Tellegen (1985) . The most famous model of emotion in the English language is the Circumplex Model of Affect proposed by Russell in 1980 . 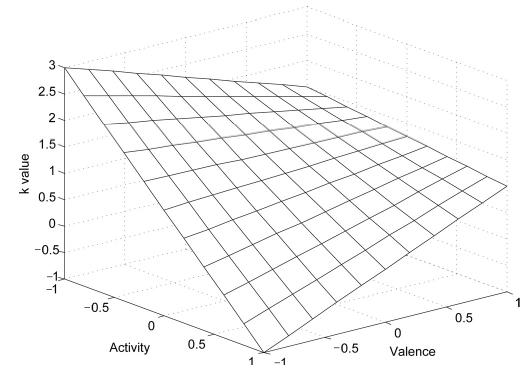 This is a spatial model based on the two primary dimensions of affect and valence. Affective concepts (emotions) fall into 2D space according to their relation to valence arousal. From now on, I will refer to this as the VA space model. Figure 4 shows this model of valance and arousal along the horizontal and vertical axis respectively. This model of emotion is extremely useful for music composition systems as it eliminates ambiguity and provides a consistent global model of emotion. Notice how the paired emotions happy-sad and serene-angry (identified earlier) also appear on opposite sides of this map. This VA model has been adopted in different ways by a large body of research related to emotion control and algorithmic composition systems related to performance, composition and synthesis . These systems use the VA map as a control strategy and present the user with a 2D plane to define the affect quality of the system . User inputs emotion intensity levels using the existing variable sliders. In this case we would only use well defined emotions from the VA plot and eliminate variables such as crazy and scared since they are not well defined in VA space. Each emotion is represented as a vector in VA space. 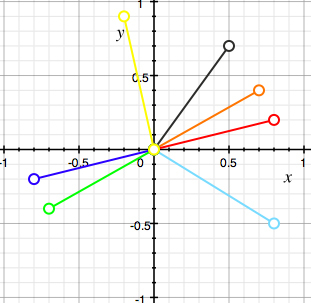 The direction of the vector is defined according to the placement of each emotion in the Circumplex model. Figure 5 shows the 7 emotions AMEE is using which are well defined within the VA space according to the color mapping in Figure 4. Every low-level dimension’s contribution is mapped independently to this VA space. This is modeled as a three-dimensional surface as in Figure 6. 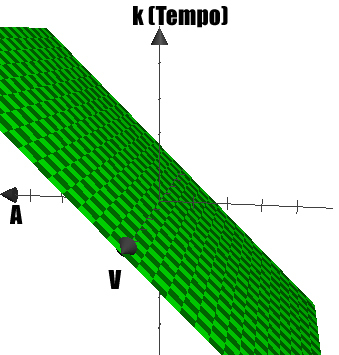 The third dimension (k) represents the contribution from -1.0 to +1.0. Here the k represents the contribution of a single dimension such as consonance, volume, tempo…etc. This surface can be defined in different ways depending on the musical element in question. If a low-level element had no contribution to any emotion then it would exist as a flat surface. Or, if a low-level element, such a volume, is correlated with arousal only the plane would be modeled as Z = A in Figure 6. The equation, which defined this k-plane (contribution), can come from well-known musical rules of thumb, existing research, or data learned from classification algorithms. 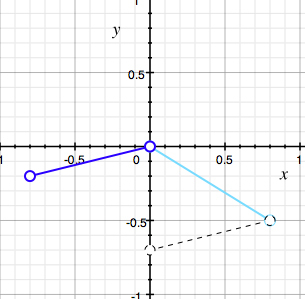 This method is powerful since non-linear relationships can also be defined by shaping the surface accordingly. See the chapter on timber for a deeper explanation of this. 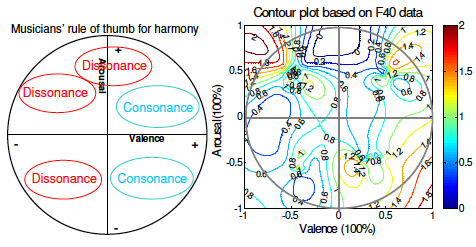 Linear mappings between VA and musical features has been adopted by Fridberg and more complex contour mappings are defined by Wu . Combine the effect of each emotional by performing vector addition within VA space. Figure shows the result of combining happy and serene at full intensity. This strategy is powerful since we can now include any number of low-level musical dimensions linked to any number of emotional variables by defining the equation of a single plane or surface. This avoids inconstancies, increases flexibility and expansion, and defines a clear global perspective of emotion. In music, expressive performance can be controlled by an individual performer’s motive, or in the case of an orchestra, by the conductor. This is done through gestures that mediate and control the subtle changes to the volume, speed, and articulation of a performance. These have been shown to be the three most important parameters used to communicate emotion in music . Even in the case of solo neutral performance, a human will impart some small natural, or random, deviations to the score. If the same solo performer intends to express some level of arousal/valence into their performance the deviations may grow and shrink accordingly (mp3 audio example follows in Appendix A). Recall the goal is not to define global attributes of volume, speed and articulation, but to define how they deviate from a global value over time. The magnitude and direction of these deviations must then be linked to VA space. Although this may seem overly subjective, it has been shown that common performance standards exist for different performers of varying skill levels . Encoding these general patterns into a VA space would provide the power to control the expressive quality of generated music according to specified mood. 8) Repetition articulation: Add articulation for repeated notes. These valance and arousal weights come out of multi-dimensional analysis of perceptual tests . 4) Once user makes an emotion adjustment, the combined mood setting is expressed as a coordinate in VA space (x,y) as previously defined. using (3). From these k values we can calculate the expressive profiles for tempo, volume and articulation with (2). Finally each parameter Sk is calculated as in (1). It is convenient that this method controls the exact same expressive variables I have grouped together in the previous plots demonstrating possibility spaces for emotion. We can now to clarify the difference between a mechanical performance and an expressive one in terms of this space. Figure 9 shows the difference between a static happy setting for tempo, volume and articulation (right) and an expressive setting (left). The sphere defines the expression/expansion of each dimension (tempo, articulation, volume); the radius of the sphere represents the amount of deviation (expression/expansion). The task is to control the timbre of a sound to have some desired emotional qualities. This requires an understanding of the relationship between low-level audio features and more abstract terms (such as valence and arousal). Audio classification algorithms based on timbre have the opposite goal: input a raw signal and extract spectral features and classify into high-level classes (such as genre, or style). Analyzing high-level feature extractors we can look for general patterns in the way features can be constructed from the bottom up. The first goal is to identify what low level musical features are relevant and how they are represented. The analysis and alteration of audio signals is described as Audio Signal Processing. First, audio needs to be defined as a time to amplitude function (or pressure wave). Digital audio is a stream of numbers that represent the amplitude of a signal at each point in time (number of points in time is called the sample rate, the number of values each measurement can take is called the sample resolution). Audio processing functions can be represented in an analog or digital format. 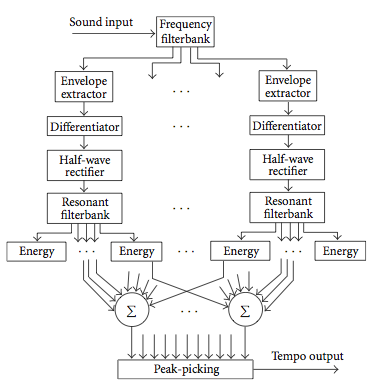 Analog processing directly alters the electrical signal (a volume knob controls a variable resistor or potentiometer) while digital processing (DSP) performs mathematical operations on the binary representation of the signal (Volume is changed by multiplying each sound sample by some value). To proceed we must understand that DSP is operating on the following three dimensions: time, frequency and amplitude. Timbre defines the quality or color of a sound; every sound producing mechanism has a unique spectral and temporal fingerprint. Voices or instruments of different timbre will sound distinct from each other even if they are producing the same pitch at the same amplitude. The spectrum of a sound is a frequency amplitude function, as every sound is comprised of a collection of frequencies at different energy levels that vary over time. 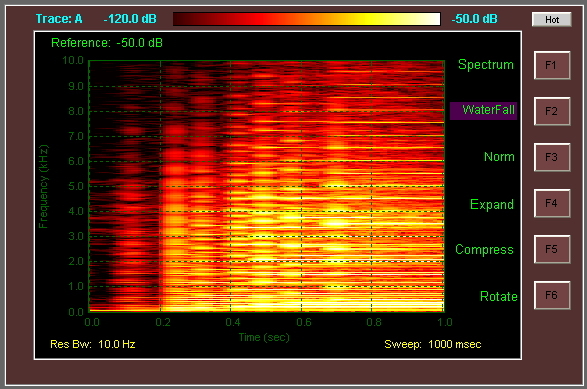 Spectrogram analysis of this function allows unambiguous quantification of these energy levels at each frequency over time. Attack time – The time taken for initial run-up of level from nil to peak. Decay time – The time taken for the subsequent run down from the attack level to the designated sustain level. Sustain level – The amplitude of the sound during the main sequence of its duration. Release time – The time taken for the sound to decay from the sustain level to zero after the key is released. Next we must understand how relevant patterns can be extracted from this fingerprint for both classification and synthesis. The type and number of musical features that can be extracted from a sound signal are immense; however, some features are more commonly used in music classification tasks. These features should therefore be relevant when defining the direction of synthesis into predefined categories. The work done by Tien-Lin Wu and Shyh-Kang Jeng is useful as they propose a novel method to automatically classify the emotions of musical segments (using 10 second sliding windows) . They use a Support Vector Machine to classify 75 musical segments into the 4 quadrants (4-class classification) of the VA space. To do so 55 different features are extracted from a musical segment, which are reduced with feature selection methods that determine the ones with best classification performance. Where cj is the average frequency weighted by amplitudes, divided by the sum of the amplitudes. The following plot shows both the musician rule of thumb for timbre as well as the contour plot of the FC classification data (Figure 12). As a rule, brightness is related to large arousal and positive valence. The FC data shows a correlation between FC and higher arousal, which is consistent. Another important feature to include which captures the rule of thumb for harshness is spectral dissonance (SD) . SD describes the smooth/harshness or stability of a sound. It is important to clarify this can be understood at the note level and spectral level. Note intervals will have certain consonances and AMEE models this aspect already (by shifting by a half tone). At the note level a highly consonant interval would be a perfect fifth or octave pair, a dissonant interval would be a minor second or major seventh. At the spectral level consonance is defined by existence of harmonics (or overtones) that are pleasing to the ear. The physical definition of this is a wave whose frequency is a whole-number multiple of another (the so called fundamental frequency). In AMEE we can use this information when making decisions for both tonal consonance (harsh tone interval or chord) and spectral consonance (harsh sounding instrument). A useful experiment done by Plomp and Levelt examined how listeners perceive consonance . They generated pairs of sine waves and had volunteers rate them in terms of their consonance. A trend emerged which is shown in Figure 13. When two tones are produced as almost the same frequency there is a beating effect people perceive due to the interference between the two tones, this beating disappears when the two tones are at identical frequencies. Figure 19 shows how dissonance varies according to intervals, notice how perfect fifth and octave intervals are more consonant than a minor second. This information can also help us expand the ability of AMEE to model tonal dissonance. Wu and Jeng also present the following plot relating spectral dissonance (harmony) to VA quadrants for both rules of thumb and classification data. Their experimental results show that strong dissonance is associated with high arousal and low valance levels. x(n) represents the magnitude (or power) of the frequency “bin” n, where N is the number of frequency bins used in the calculation. An example of a spectral flatness would be white noise since it is defined as having equal power in all spectral bands. As expected timbral width and spectral sharpness have similar locations in the VA space since they are functionally similar. The final feature AMEE should incorporate are independent concepts of loudness and volume. Currently AMEE models volume as it relates to amplitude and sound pressure. It does not include loudness as a low level feature. Loudness is more subjective a measure influenced by the frequency spectrum and bandwidth. A simple example would be the difference between a single instrument producing a musical line and multiple instruments producing the same musical line. This may not increase the decibel level of the sound but a listener will describe it as sounding fuller or bigger. I will leave the application of this low level feature for future work. Low Valence – Brass, low register instruments, string ensembles, violin, woodwind and piccolo. High Arousal – Brass, bright trumpet, timpani. Low Arousal – Woodwind, classic guitar, lute and soft sounding instruments. This instrument choice variable is then placed into one of 6 bins depending on its value (which ranged from -1.0 to 1.0). From my initial listening tests and feedback from volunteers, it is apparent that this effect greatly enhances the emotional changes perceived in AMEE. This directly addressed the proposed “improvements to musicality” as defined in the AMEE literature. What is interesting about this method is that it allows an infinite variety of possible instruments with a simple extension. Instead of mapping one instrument to each region of the VA space, we can map a collection of instruments. This would allow the user, or the system, to cycle through different options within some static mood setting. This could be implemented as a pseudorandom choice, or it could be user controlled. The proof of concept code was inserted into standardLineProducer class within the fillMusicalBlock() method (see Appendix B). By tuning these parameters, we can find a natural approximation of the sound produced by a bowed instrument. The power with this low-level approach is that we can alter an instrument to have some desired spectral qualities. We could begin with a soft string instrument and slowly transition into a harsh one by adjusting appropriate parameters. The following work presented a new control strategy to improve AMEE’s ability to model emotions. It resulted with a proposed change to the overall structure of emotion control – which I’ve named the CPS approach. To support this change a new freamwork for emotion control was also defined. This lead in two new modules for the system to adopt: Expressive Performance and Instrument Synthesis. Each of these modules was defined and relevant research used to identify the most salient low-level features required to model emotional affect. All of the initial questions outlined in the introduction of this report (broken down into A and B) have been addressed and solutions proposed. Implement the new CPS control strategy in AMEE. Write a synthesis and expressive performance module based on the research done and incorporate the new low-level elements defined in this report. Explore how different expressive profiles could be stored in pattern libraries by users. Explore generative music models as an optional method to encode expressive performances (and improve melody generation). This topic has been explored, but not relevant to this report specifically, an initial outline is listed in Appendix C.
Improve the simplified linear model of expressive performance outlined and incorporate more of the KTH rules. 3) Canazza, Sergio, Antonio Roda, and Patrick Zanon. “Expressive Director: A System For The Real-Time Control Of Music Performance Synthesis.” Proceedings of the Stockholm Music Acoustics Conference. (2003): pg 1-4. Sounds.” Proceedings of the 12th INternational Conference on Auditory Display. (2006): pg 2-3. Advances in Cognitive Psychology. 2.2-3 (2008): pg 145-161. 7) Friberg, A. “pDM: An Expressive Sequencer with Real-Time Control of the KTH Music- Performance Rules.” Computer Music Journal, MIT Press. (2006): pg 2-5. 8) Grindlay, Graham, and David Helmbold. “Modeling analyzing, and synthesizing expressive piano performance with graphical models.” Machine Learn. 65. (2006): pg 361-387. 9) Huron, David. Sweet Anticipation – music and the psychology of expectation. Engine. Proceedings of AudioMostly 2007: The Second Conference on Interaction with Sound. Ilmenau, Germany, September 2007. 11) Hoeberechts, Shantz. Real-Time Emotional Adaptation in Automated Composition. Proceedings of Audio Mostly 2009: The fourth Conference on Interaction with Sound. 2009. 12) Lang, P.J., Bradley, M.M., & Cuthbert, B.N. Technical Manual and Affective Ratings. NIMH Center for the Study of Emotion and Attention . 1997. Print. 13) Malloch, S. “Timbre and Technology: An Analytical Partnership.” Contemporary Music Review. 19.2 (2004): pg 53-79. 14) Meyer, L. B. Emotion and Meaning in Music. The University of Chicago, 1956. 15) Oliveira, Antonio, and Cardoso . “Towards Affective-Psychophysiological Foundations for Music Production”. Lecture Notes in Computer Science. (2007): pg 2-4. 17) Oliveira Antonio and Amilcar Cardoso, “Emotionally Controlled Music Synthesis”, 10th regional conference of AES Portugal, Lisboa, 13 – 14 Dec. 2008. 20) Schlosberg, H. “Three dimensions of emotion.” Psychological review. (1954): Print. 21) Wu, TL, and SK Jeng. “Automatic emotion classification of musical segments.” 9th International Conference on Music Perception and Cognition (2006): n. pag. Web. 30 Mar 2010. 22) Thompson, W. Music, Thought, and Feeling: Understanding the Psychology of Music. Oxford: Oxford University Press, 2008. pg 46. This entry was posted on May 31, 2010 at 4:59 am and is filed under Random Stuff, Research and Projects with tags "Computer Music", additive synthesis, algorithmic music composition, algorithmic music for video games, Algorithmic music synthesis, Amilcar Cardoso, Antonio Oliveira, aritifical orchestra, Artificial Intelligence, circumplex model of emotion, computer science, dimensions of emotion, douglas cope, Douglas Eck, emily howell, emotion control in generative models, Expressive performance algorithms, generative models of music, Generative Music, low-level music features, mood control, music affect, music and emotions, music and mood, music classification, sprecturm, subtractive synthesis, timbre, video game music. You can follow any responses to this entry through the RSS 2.0 feed. You can leave a response, or trackback from your own site.